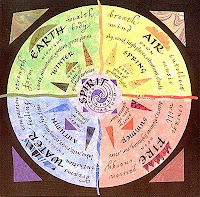 Store BLOG of Shadows: FAQ: What are the elements and what are their attributions? FAQ: What are the elements and what are their attributions? Association:Earth is the element of stability and the physical. Earth is often associated with material well-being such as money, home and prosperity, stubbornness and healing on the physical level. Tool/Tarot Suit:The Shield and the Pentacle. Symbols: Salt, Soil, Bread, Horns, Stone, Leaves, Bark. Scents: Pine, Cedar, Amber, Patchouli, Sandalwood. Association: Air is the element of the mind, communication, language, writing and imagination. 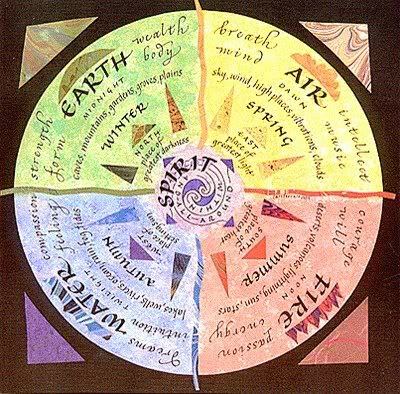 Air is often associated with anything having to do with the mind or mental processes and is often invoked for study, philosophical thought or automatic writing and healing of mental illness. Symbols: Feather, Rose, Quill or Pen, Parchment, Book of Shadows, Fan. Scents: Hyssop, Mint, Violet, Moonflower, Lavander. Association: Water is the element of emotions. It is associated with peace and calm but also sadness and every other emotion. Water is also associated with empathy, mystery and healing on an emotional level. Tool/Tarot: The Cauldron and the Cup (or Chalice). Scents: Lotus, Vetiver, Cucumber, Rosemary, Orris, Jasmine. Association: Fire represents the will, creativity and passion as well as renewal but also destruction. Fire is also associated with strength and power. Symbols: Flame, Candles, Lamps, Censer, Incense. Scents: Neroli, Nag Champa, Cinnamon, Allspice, Ginger, Clove. Associations: Spirit is the element of the soul, the divine and the supernatural. Tool/Tarot: Spirit does not have a tool but is associated with the Major Arcana in the Tarot deck. Symbols: White Light, Quartz, Crystal, Crystal Balls, Crosses, Doves, Smoke. Come check out our Elemental display at the store for more ideas of tools and associations for your altar or elemental workings! Classy pens, incense burners, and leather oil!